The primary reason cyber-criminals access an online medical account is to steal a person’s identity. 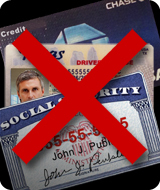 ECD has eliminated the primary content that leads to identity theft. Digital access to your medical information. If you have been to a doctor, had a procedure done in a lab or had an X-ray taken, your medical records are already online. If your medical information is on a server somewhere it is online now. The doctor’s offices, labs and hospitals ask you for your personal identifiers, like driver’s license number and social security number and sometimes they have your credit card information. ECD does not ask you for any personal identifiers or store your credit card information. An identity thief will seek your doctor’s computer system or the hospital’s computer system before ECD, as ECD does not have your personal identification information. What if somebody gets my mobile device or Member ID card and can see my emergency profile? Once you have changed your password, your mobile device will not display your medical and contact profile until you login to the device with your new password. If you lose your phone or if it is stolen, you should immediately call the telecom carrier that provides your phone service and tell them of the event. Your carrier will turn your phone off and all your information will be secure. I don’t need the ECD system, I am very healthy. Many people think they are so healthy that they don’t need or have a use for an Emergency Contact Data system. This is absolutely untrue, as no one knows when a medical emergency or an unexpected accident may involve them. Each of us hears of people having sudden heart attacks or seizures at very young ages. One never knows when his or her first or next medical emergency might happen or when they will be in an accident. Carry a copy of their profile in their vehicle’s glove compartment. Email that same profile to a friend, to a new doctor’s office, or to the place where a person may be having a medical procedure done. Have an easy to use, complete personal and medical profile available when they visit a new doctor for the first time. Give emergency responders their personal medical and contact information when they need medical assistance, 24/7 – without ECD it could be hours before their medical profile with medical alerts can be gathered for them. Let ECD be their medical memory – As people have more medical issues it becomes difficult to track and nearly impossible to remember all of them, especially when they need to tell each doctor about all of their conditions. Protect themselves in a real catastrophic situation even when telephone lines are down and nobody can access a person’s records. With Emergency Contact Data, a member’s emergency profile is stored on their mobile device and as long as the device will power up, the member can access his or her emergency profile information immediately, anywhere in the world. ECD is for the family pet, too. Members can enroll their cat or dog in the ECD. Then his or her family pet is just as protected as he or she is and the same great utility exists for every member of the family.